AT LAST – the OFFICIAL BIOGRAPHY of Iron Thunderhorse, Quinnipiac Grand Sachem, Vietnam Vet, and American P.O.W. as told through his writings, poetry and art by his wife Ruth Mahweeyeuh Thunderhorse. Born with one foot in the roots of two tribal cultures – IRON THUNDERHORSE has led an amazing life – struggling against abuse, stereotypes and obstacles of all sorts. Adhering to cultural traditions dating back 10,000 years he has successfully overcome those obstacles establishing himself as a linguist, historian, columnist, Thunder Clan Shaman, Quinnipiac Grand Sachem and political activist for the human rights of indigenous tribal autonomy, prisoners, veterans, handicapped, wildlife, environment, religions, etc. What is so amazing is that he accomplished all this and more from a Texas prison cell. This is the official-authorized BIOGRAPHY written by his beloved wife. "Following the Footprints of a Stone Giant" provides a unique approach to the inspirational saga of an American hero and his once-great Quinnipiac Nation. With passion and respect, the author reveals the multifaceted genius of this Green Beret and Native American P.O.W., predominantly through his very own words and artwork. 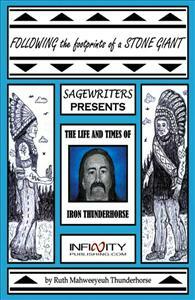 Reviewer: Robert Gray Wolf, Ph.D.
"Following the Footprints of a Stone Giant: The Life and Times of Iron Thunderhorse" is an important document and a sacred book. On one level, Iron's struggle to resurrect the Quinnipiac culture and the pride of its people is parallel to the epic of Moses or even the sacrifice of Jesus. Iron has sacrificed his life and endured great suffering for the good and the survival of his people. The biography's underlying message of "a profound leader's struggles to save his people from a great storm of adversity" - this is a story of biblical magnitude! There is a "subliminal feel" to all of this, that the book was almost like a "GOSPEL OF THE QUINNIPIAC." On some level, Iron's biography must be treated as a significant document because it describes his heroic efforts to save the life and the very spirit of the Quinnipiac people. And the author has put all this into context by reciting the entire Native American history leading up to the point that Iron entered the modern picture (pp. vi to xi). Included in the book are many pictures and place references that are sacred to the Quinnipiac. Where John Menta's thesis is a very clinical ethnography, "Following the Footprints of a Stone Giant" instead speaks to the SOUL AND HEART OF THE QUINNIPIAC PEOPLE and it does so because both Iron Thunderhorse and his wife have shared their hearts with the reader. The Quinnipiac Indians were the orriginal inhabitants of the area in and around the colonial and modern city of New Haven, Connecticut. Every American should know the history of this tribe, because here we will also find a part of the early history of our country. This book brings the reader into this present and past, and makes us aware of what has happanded to the Quinnipiac people and how it all took place. I hold this book in a place of honor in my bookcase. Iron Thunderhorse, is one of America’s "disappeared," a Vietnam Veteran and political activist, who has been incarcerated on false charges for the last thirty years. Even the Texas Prison system, one of the worst on the planet, has not been able to quell his spirit or prevent him from carrying on his life’s work. Following the Footprints of a Stone Giant: the Life and Times of Iron Thunderhorse is a beautiful heartfelt biography written by Iron's Thunderhorse’s wife, Ruth Mahweeyeuh, headwoman of the Quinnipiac people. It is also a digest of Iron Thunderhorse's own prolific writings as a scholar, linguist, historian, spiritual leader, artist and political activist as well as a history of the Quinnipiac people of whom Iron Thunderhorse is culture bearer and Grand Sachem. Among Iron Thunderhorse's many accomplishments is the revival of the Quinnipiac language, for which he has written a complete language guide and primer. (For more on Iron Thunderhorse and a list of his publications visit: http://www.acqtc.com/ and http://saveironthunderhorse.com/ .) A fascinating book in itself, Following the Footprints of a Stone Giant: the Life and Times of Iron Thunderhorse is also a call to action. Read the book and write your congress people; alert other activists and organizations and urge them to do the same. Iron Thunderhorse is in very poor health and is receiving little or no medical care. It would be a huge loss to his people and to us all should he die in prison and not have the chance to transmit his wealth of knowledge to the next generation. You can't read his story without feeling his longing to return to his sacred place, the Quinnipiac (land of the long water) in South Western Connecticut also known as the Dawn Land.